I have managed to piece 160 triangles together, and only have 160 more to go! Some more layout photos. I'm not sure which layout I like now... Maybe you can help me decide by voting in my poll over on the sidebar! In other quilting news, I finally decided to dust off this old quilt top and get it quilted. The fabrics are begging for hand quilting, and I don't have the attention span to quilt it myself, so I am sending it off to the Amish to quilt for me. 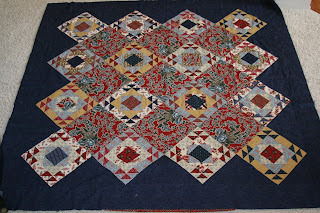 It is so fun to send a quilt top to them, and have it come back as a beautifully finished quilt! Can't decide which one I like the best. 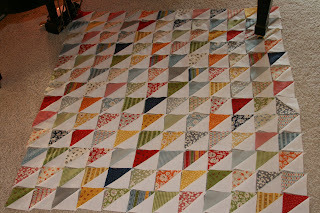 However, I love the quilt top you are sending to be quilted. Ethan really gets into his drawing. Love the face!!! not that what i have to say pulls any weight at all, but i like the one patch. i think it showcases the fabrics a little better. i wanted to say barn raising because i think that's a beautiful pattern, but i think that and the zigzag make the white stand out more. you don't get to see all your fun fabrics as much. I use www.amishquilting.net They say their turnaround is about 12 weeks, although last time I sent a quilt it didn't take that long. Up for trying one more layout? Use Barn Raising but take it off center. It adds a lot of punch for no additional work. Move the center one up and two over or two up and one over. This is Leanne Harris, remember me? I was going through the blogging world and clicked onto you guys. Your family has grown so much I can't believe it! I don't know that much about quilts but I like the one patch. You are so talented! I voted. I must turn the tide on those who voted for #2 LOL! Looks like Ethan has a nice manly scab on his knee! whoot whoot! I still like the first top best! When are you sending the quilt? 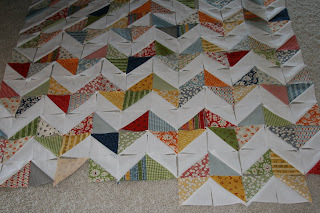 I had forgotten how beautiful the fabrics are... what thread do you wanted used for quilting? i like the zig zag myself. speaking of quilts. i need your email address again, i can't seem to find it & i need your quilting expertise. 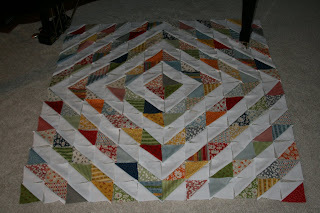 i just finished a top, but i'm trying to pick border, binding, and backing & am struggling! as for the onesie... it was really easy. 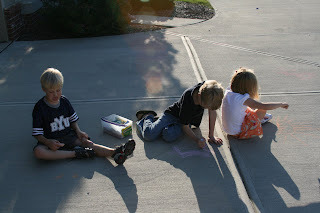 we used felt as a stablizer, basically we cut in in an oval shape. you don't really need the stablizer, but it provided a nice shape to follow when sewing on the trim. then we just kind of pleated the trim into a u-shape, layering several rows. for the collar i used cream felt that i just sewed to the top & a satin ribbon & some pearl buttons. for another one we didn't do the collar or ribbon, & did pearls all along the top... it looked like a pearl necklace. i actually preferred that look, but you have to use a piece of trim that looks nice on top. fray check all the edges and viola! as for a tutorial, maybe i'll do one. but do you think it's rude, considering i basically borrowed the idea off of etsy? what are your thoughts? I love all the settings of your quilt! seeing all the possiblities makes me want to start working with my charm packs that have been sitting around for months. Ginger, I love the quilt. The fabrics are great. Where do you get your fabric from? A good store or online? I can't believe you play the bass. I picked up guitar shortly after freshman year then after being married a few years and always wanting an upright bass player, I took up the bass. I'm not great at it, but everyone always wants to me to play with them because the bass adds so much. You need to get one. I have a bottom of the line one I got online (around 1K) and it's perfect. Fancy ones are so expensive.